A few decades ago, before the Gallery Walk, before the great influx of Brattleboro-based artists, before even the Apple Tree Gallery on High Street (possibly Bratt's first art gallery), back when the BMAC was a delapidated train station, there was a war on in Viet Nam, Timothy Leary was the new luminary, and a conversation about art and expression was evolving over a dinner table in Putney. The house was that of David Rohn, head of the Windham College Art Department at the time, and the conversation was between the esteemed watercolorist and a vibrant young artist named Nancy Storrow. It was there, in a country setting hard to recall, that a young boy of fifteen, as a friend of David's son Chris, encountered the serious curiosity and inspired ideals of dedicated and mature artists for the first time. It changed my life. In presenting new work in pastel on paper by artist Nancy Storrow, the Brattleboro Museum & Art Center has done well in its role as a selective venue for the art of Southeastern Vermont. If the words "local luminary" are ever applicable to a Windam County artist, now's the time. As noted by curator Linda Rubinstein, Storrow has exhibited her work in New York as a member of A.I.R. Gallery, the first Women's Art Gallery in the United States, for the past twenty-five years. The works presented at the BMAC have also been exhibited at the Brooklyn Botanical Gardens (adjacent to the Brooklyn Museum) in the Steinhardt Conservatory Gallery. Nancy Storrow's art, as exemplified in this group of pastels, couples the grounding of an historic sense of what makes art strong with an absolutely personal vision loyal to both nature and expression. And in doing this it burdens not the viewer with literal information but presents a synthesis of nature and the human spirit, more specifically the female spirit, or the spirit of life and creation. 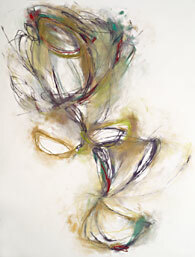 Storrow has said that she finds works on paper to be one of the most elemental types of human expression. In these works on paper, pastel is applied with an earthy palette which allows colorful hues and rich tonal subtleties to emerge from an intuitively expressive yet carefully found combination of organic forms, rendered in lines and smudges, edited and modified with negative erasures. Her work in pastel has all the freshness and direct commitment of excellent watercolor technique while having the strength of composition, and depth of expression, found in good oil painting. 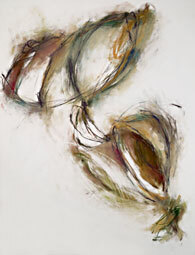 Seeing her combinations of organic leaf, pod or butterfly forms is fulfilling for the viewer, calling up remembrances of moments of observation and wonder at nature. In a work entitled "Composition #1," forms float in a "humming" space, busy with lines rendered sanely this side of the frenetic. The lines themselves have a "charged" presence, as does every rub or erasure involved in the finding of forms, which emulate natural objects such as shells, pods, leaves or moths. 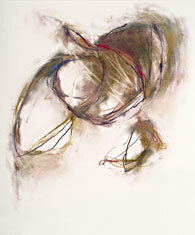 In this piece, the forms seem to be moving through stages and objectify a feeling of metamorphosis. Wine reds and straw ochres shimmer darkly from the earth tones. "Big Red" features an expression of interdependence and evolvement through two connected forms. The warmly toned but sparsely described form below appears static, while the upper form, to which it is connected by an earth green pastel mark, vibrates in a balletic opening of petals. It is like the root and flower, or the heart and mind. Weightlessness can be felt in a work entitled "Composition with Red Iris." This foray into the familiar family of forms is concentrated at the top of the composition. Thus the shapes settled upon emulate the fluttering of a moth endlessly seeking, as it does, the light. These pastels, which are generally medium in size (19" x 22" and 26" x 32") are giant in presence. Their elegance emerges from a deep earthiness and a process of intense intellectual expression. As inspired compositions, they are metaphorically poetic. Clearly a Modernist, Nancy Storrow knows what she is doing and does it well. And so, it appears, does the Brattleboro Museum & Art Center.